I’ve been pretty spoiled since the start of my baseball life by living in waterfront cities in New England. As a Colorado girl, to have fresh lobster swimming in my backyard in Maine, and just-caught clams for my chowder in downtown Boston is like living in a dream. So it is seems only natural that my first airplane trip for my Baseball Bucket List would be across the country for a new type of seafood fare; crab legs, fresh shrimp, oysters and salmon are on the menu? Seattle, here I come! 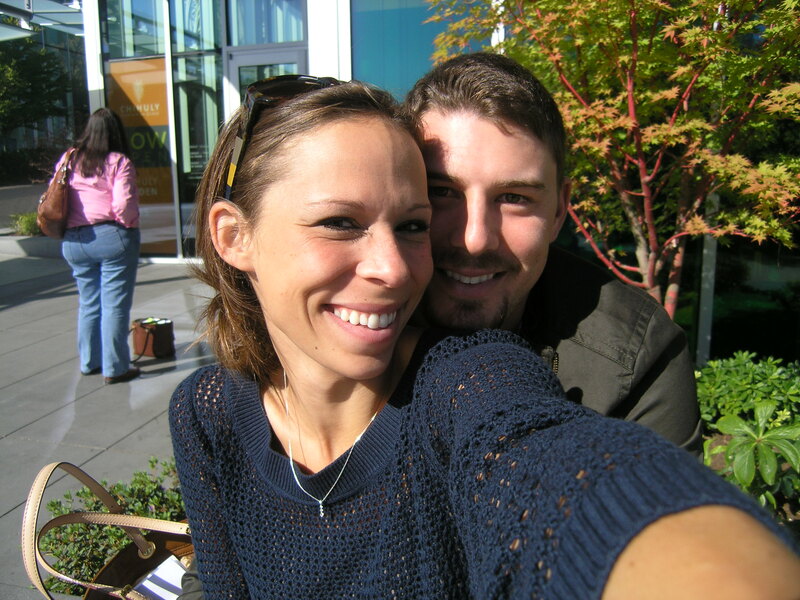 If you visit downtown Seattle on a beautiful sunny day, you will naturally be drawn to eating on the waterfront. Between the sunshine and water, the chaos of Pike Place Market, and the aromas of the dozens of restaurants wafting through my senses- it’s easy to feel a little overwhelmed by the thriving atmosphere. To enjoy it best you have to sit down, have a local beer, and some spectacular food. I have to say I did an excellent job of just that; here are my recommendations of where to eat if you are roaming and hungry in Seattle. For breakfast with the locals: Three Sister’s Bakery. This little bakery is tucked in the street-side shops at Pike Place Market. There are a few bar stools if you want to eat breakfast there, or you can order and take their menu items and drool-worthy pastries to go. I ordered simple: bacon, egg and cheese on a croissant for mi amour and a bagel with local smoked salmon for moi. Delicious and hearty, exactly what we wanted before a day of walking around town. The raspberry cream cheese muffin and honey walnut rugulah we ate later in the day were the perfect sweet treat. It’s a local joint, just the way I like it. 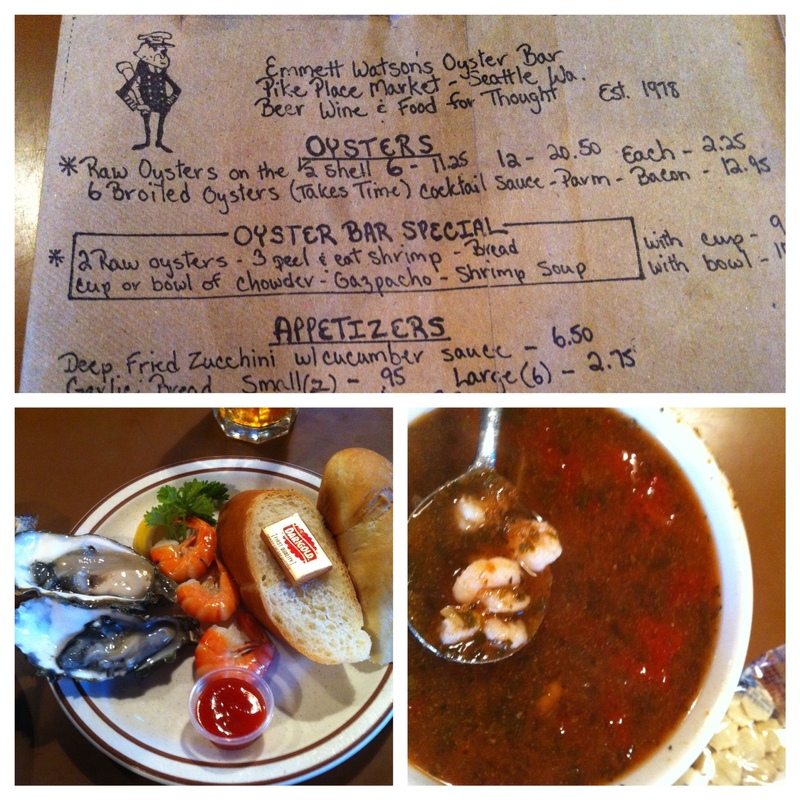 For a no frills, seafood lunch: Emmett Watson’s Oyster Bar. You have to seriously look for this restaurant because it’s tucked into the street-side shops and is really easy to miss. I ate here my first day in Seattle while I was waiting for Ryan to arrive from Oakland. I got a little sampler trio of fresh oysters, peel-and-eat shrimp, and spicy shrimp soup; the perfect Northwest appetizer to wet my palate. 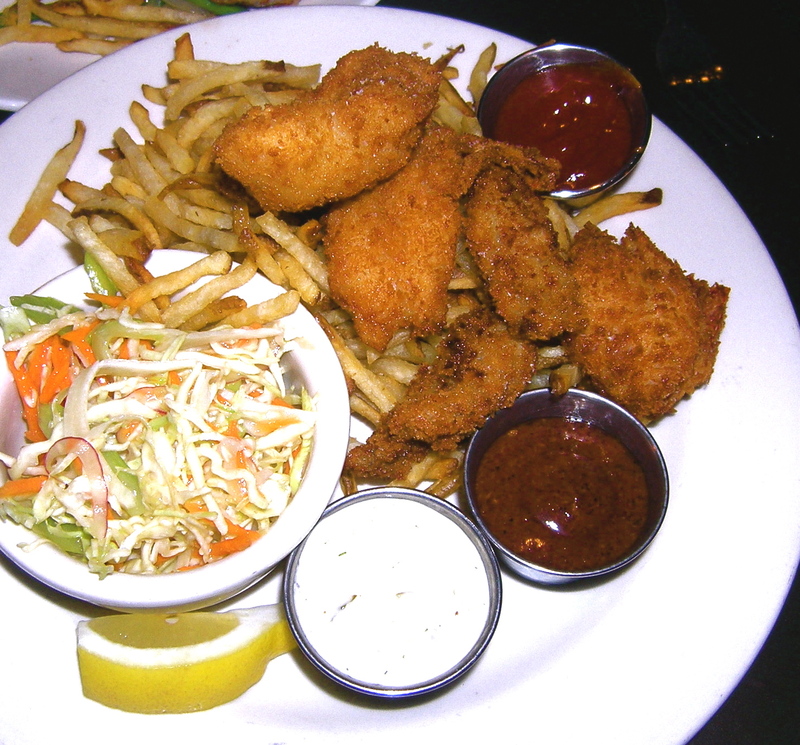 I sat at the bar and almost fell off my chair when the fried fish walked by. I’d definitely recommend that for next time. They serve about a dozen local beers for the ultimate Seattle lunch. For a little more frills and a lot more scenic brunch/lunch: Seatown Seabar & Rotisserie. This was my last meal in Seattle and the perfect ending to my vacation. I like Seatown because their lunch menu it features down-home items compared to the trendy dishes of its counterparts. 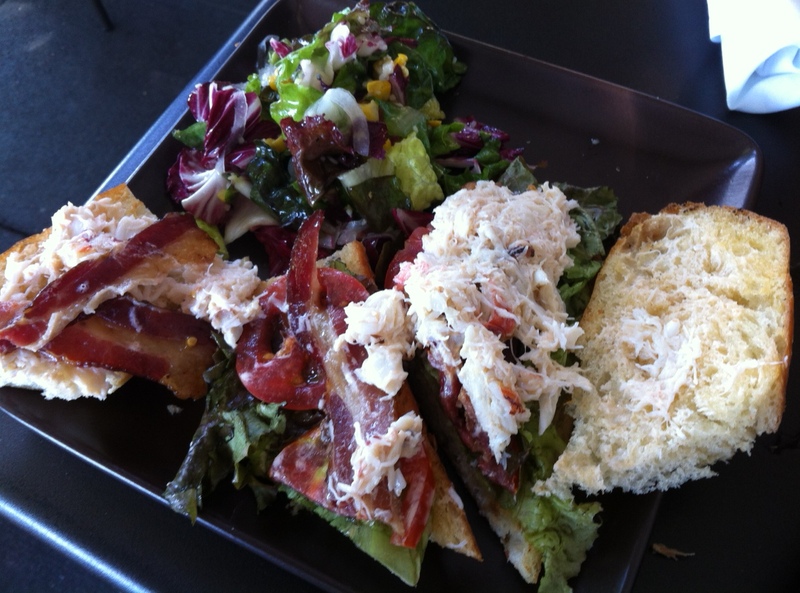 I ordered the crab blt and it was made just as one should be; fresh crab (ask for light mayo, it tastes much fresher that way), heirloom tomatoes, thick bacon, baby greens, on a toasted baguette. The woman next to me came back again (evidently she was here yesterday too) for round two of the pancakes. So I guess stop in and order those as well. They serve breakfast and lunch until 3 pm late risers. For an expensive and picturesque meal: Cutters Crabhouse. I can’t speak too much about the food at Cutters, but I can speak quite highly of the beautiful view that you get of the water while you eat. We just stopped in for a snack, the soft shell crab sushi roll to be precise, and really enjoyed it. You won’t eat here for cheap, but you will have a memorable meal. 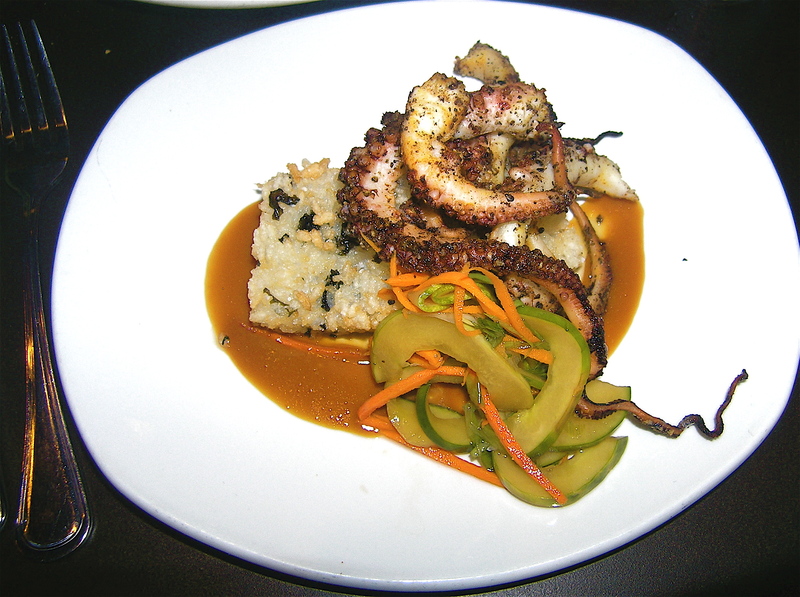 For a dinner full of spice and something nice: Etta’s Seafood. Etta’s was the lone meal I ate with my comrade, which made my dining experience even more special. Etta’s is owned by restaurateur Chef Tom Douglas, the big name here in Seattle. He owns about six different restaurants with varying prices and themes, depending on what you are in the mood for. Etta’s is famous for their spice rubs which accompany everything from masala infused shrimp and their traditional fresh caught salmon. We splurged on a little bit of everything and weren’t disappointed. The crab cakes were among the best I’ve ever tasted, the grilled octopus was simply served with crunchy rice, the field green salad was perfect, and the fish and chips were crispy and mouth-watering. I’d say skip the clam chowder, which ventured away from the traditional version that I was craving. We topped it off with Ovaltine panna cotta (yes, the chocolate milk powder), which was the perfect sweet ending to a delectable meal. I almost went back again for lunch the next day, but decided to savor the idea of coming back again next year. For life changing hot chocolate: The Chocolate Box on 1st and Pine. If there’s one thing my future husband loves it’s hot chocolate. He wanted to go to the original Starbucks and as usual, I turned him down and had a better idea. It’s a good thing he’s learned to listen, because he says his life is changed because of the hot chocolate we had that afternoon. I’ll tell you their secret when I make my own version this winter 😉 . Jamie : When next you visit Seattle, check out Ray’s Restaurant ( it’s actually in Ballard, Wash.). Jane’s brother lives in Seattle and when we last visited , this was the one we liked most. It was owned by Jack Sikma, former Seattle SuperSonics center, from back in the ’70’s. As you approach the dock at the main entrance ( it’s on the waterfront), you encounter a crab tank, filled with Dungeness crabs. They are awesome and are a distant cousin to the R.I. Sand Crab, similar, but quite larger. They were delicious, as were the scallops, shrimp, and salmon that we ate there. Enjoyed it so much, we bought the cookbook ! !